A ball-point pen is often called a Biro, because the brothers Biro invented it. By the end of the 18th century several people in different countries had thought of writing with a ball instead of a nib. But none of the methods really worked. Lazlo Biro was a Hungarian sculptor, painter and journalist. His brother Georg was a chemist. They worked on designs for a ball-point pen, and by 1938 applied for patents. Then war came, so the brothers moved to the Argentine and went on with their experiments. Their ball-point pens came on the market during the war and were popular straight away. Here was a new ‘writing stick’ which didn’t have a point that broke and needed sharpening like a pencil. And it didn’t have a reservoir which needed refilling all the time like a fountain pen. But the ink for ball-points was still a problem because it had to be thick enough not to leak out of the ball, yet dry quickly and cleanly on paper. 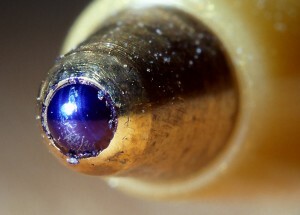 Fran Seech, an Austrian chemist living in California, invented an ink which greatly improved the ball-point pen. It formed a surface skin as soon as it was exposed to air, and dried instantly. For a while Seech made the ink in his kitchen at home. The first ball-point pens were sold in England for £2.75. Now you can buy throw-away versions at very small cost. The ball of the pen sits in the metal tip so that it cannot fall out but can roll around easily, collecting ink from the reservoir. Georg Biro thought of putting a tiny vein-like tube between the ball and the reservoir, so that the ball is kept moistened by capillary attraction. How Do Quartz Watches Work ?